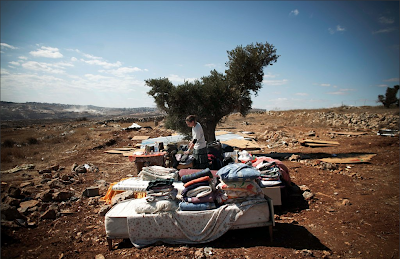 (Notes on) Politics, Theory & Photography: "Settlers" in the West Bank: What Do We See? outpost of Ramat Migon, a hilltop site near Ramallah in the West Bank. Photograph © Tara Todras-Whitehill/Associated Press. Over at The New York Times recently I've come across some striking images made by Tara Todras-Whitehill of Israeli settlers in the aftermath of having their homes demolished. I've lifted one of these images above. What I find interesting is the pathos of the images and the way that the caption does not quite name the "settlers" as criminals. These are people who, in fact, are violating the law and who are not being "removed" and so simply rebuild. What we see is the perseverance of apparently isolated settlers. This, at best, is a partial view. What we tend not to see - or perhaps I am simply overlooking the images that actually appear - are photographs of the settlers rampaging against Palestinians and their supporters who seek to defend their land in the territories. Nor are we seeing the true scale of the illegality here - the systematic land grab that is going on with at least a wink-and-a-nod from and often with the active connivance of the Israeli government. * Likewise, we are not seeing - same caveat - the conflicts between the settlers and the Israeli troops who are sent to demolish illegal construction. By contrast the stereotypical shot of Palestinians is of youth throwing rocks at Israeli security forces. Have I just missed the broader depiction of the dynamic in outlets like The Times? For a harrowing first hand report on the scale of the Israeli building program in the West Bank and an equally harrowing account of the violent reaction to anti-settlement protests I recommend this two part post by David Shulman at the NYRB.blog. In closing I want to be clear that I am not criticizing Todras-Whitehill here. In fact, her work is quite impressive. I am raising questions about the appropriation of particular images by mainstream press outlets. And perhaps I am raising questions about the possibilities of actually photographing the sorts of things I mention. * In the first of the posts I recommend, Shulman offers this sketch: "According to the statistics compiled by Peace Now, in the ten months following the end of the “as-if” freeze on building in the territories in October 2010, work began on 2,598 new housing units; 2,149 new units were completed, and building continued on at least another 3,700. The rate of housing construction per (Israeli) person on the West Bank was double that in Israel proper. If you drive south from Jerusalem along Road 60, the main north-south artery, you see signs of building by settlers everywhere." We are not dealing with isolated violations.